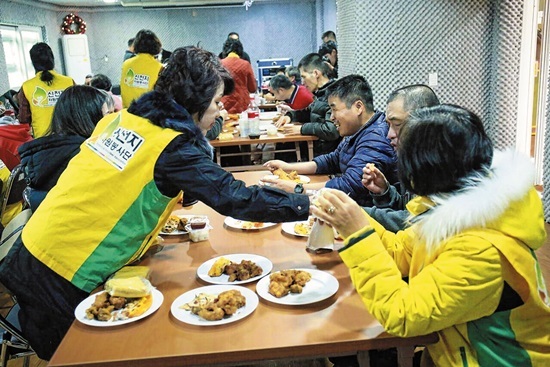 ▲ Ulsan Branch of Shincheonji Volunteer Group (the manager Cheolhan Bae) held the year-end event ‘The Love for Neighbors’ in Gwangmeangwon, the short stay facility for the visually impaired, on 21 this month. Ulsan Branch of Shincheonji Volunteer Group (the manager Cheolhan Bae) held the year-end event ‘The Love for Neighbors’ in Gwangmeangwon, the short stay facility, for th e visually impaired on 21st of Dec., 2018. ▲ ‘The Jade-green Heavenly Art Festival’ hosted by Ulsan Church of Shincheonji was successfully held with friendly neighbors on 25, celebrating Christmas. 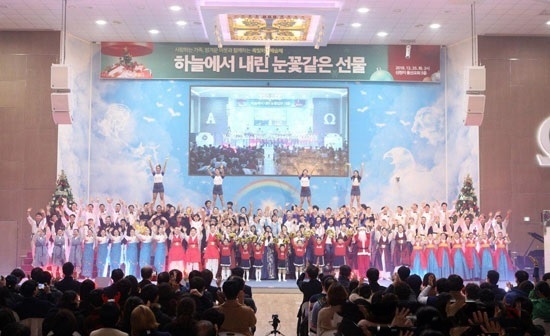 The festival was started with the songs ‘Halleluiah’ and ‘Beautiful Country’ performed by a full chorus of more than 130 including students’ brass band of Ulsan Church. Orchestra, Korean traditional music, Taekwonmu, dance performance, etc. Ulsan Church of Jesus the temple of the Tabernacle of the Testimony (the director, Cheolhan Bae) held ‘The Jade-green Heavenly Art Festival’ on Christmas, inviting the local residents, neighbors, families, and friends. There were various cultural performances on this Christmas event which ran between 3 to 5 on 5th floor of Ulsan Church in front of 2000 local residents and neighbors. The first part of the show began with the songs ‘Halleluiah’ and ‘Beautiful Country’ by the full chorus of more than 130 including the students’ brass band of Ulsan Church. ▲ Shincheonji Ulsan church held ‘The Jade-green Heavenly Art Festival’ on 25 celebrating Christmas. There was a dizzying stunt show at the festival. After that, ‘Everlasting Light Art Group’ continued to perform Korean Traditional Music with the group drum, Janggu (double-headed drum) and the small drum. The lively Taewondmu and the dizzying stunt drew a great cheer. The dance by ‘M-Crew’ also spiced up the show, engaging with the audience. During the intermission, Santa and Rudolph came up on the stage to give a surprised gift. 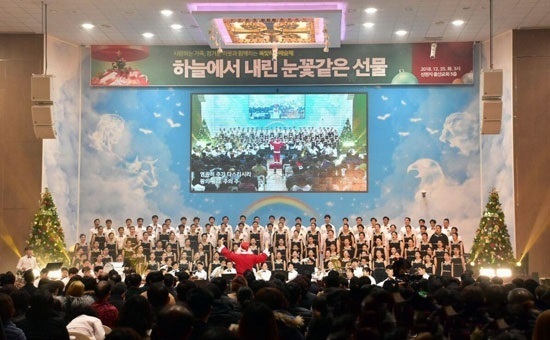 ▲ The curtain of ‘The Jade-green Heavenly Art Festival’ hosted by Ulsan Church of Shincheonji had risen in front of 20,000 audience of beloved family members and friendly neighbors for Christmas. 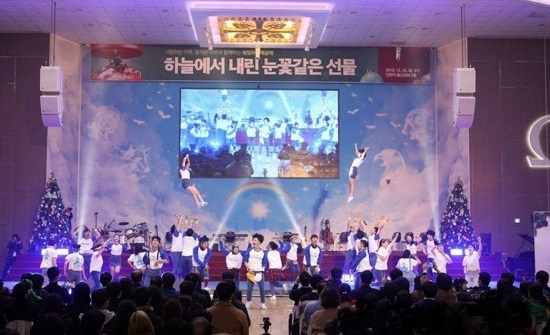 There were an exciting Gukak performance, a lively Taewonmue, a dizzy stunt and a dance performance including songs by a 130 full chorus of the students’ brass band of Ulsan Church. The audience gives an endless cheer until the last performance. Especially, the family members and relatives invited to the show told how they felt about their visit to the event. A woman in her 20s who were invited by her boyfriend said, “I had a prejudice against Shincheonji church by the internet and my friends going church. However, from the guiding to the show, it was very different from the public eye, and I had a special date on Christmas.